« Find mini Arnie win gear! Echo 1 USA, the leaders in the US for low cost, reliable and what now seems unique products has now announced the release of there new product. The Echo-614. As you can guess this is a replica of the popular HK 416. 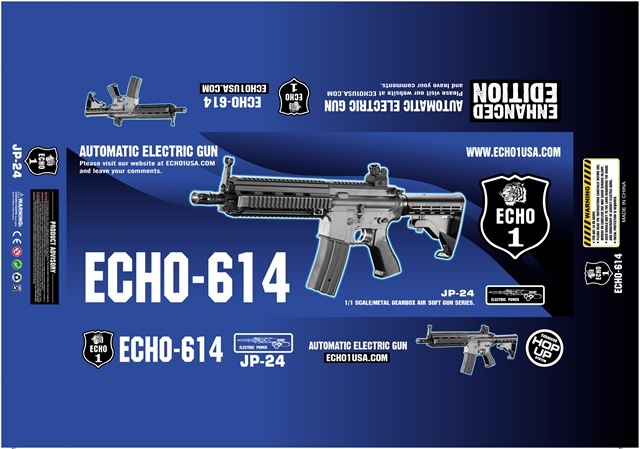 ECHO-614 will be available soon! Metal Bushing and Spring guide. Pre-upgraded just like all other ECHO1 AEG. Plastic body with laser engraving. Provide warranty and local customer service in USA.